Hit by the recession or maybe just retiring or moving on, there are countless owners of small businesses who’d like to sell up. Business transfer agents are supposedly there to help them find a buyer. But today I lift the lid on a string of them who demand huge fees even when they fail to get a sale, and then sue clients who refuse to pay up. Verdicts on business transfer agents don’t often come much more damning than this. The case involves one of the most notorious firms in this field, RTA Business Consultants. It failed to find a buyer for a family-run car parts firm but still demanded payment. When the owner, 70-year-old Andrew Rothery, refused to cough up, RTA sued. Its rep Jen Leary bragged she could value a business “to the penny” but got the price of Mr Rothery’s firm wrong by £700,000, Halifax County Court was told. She lied that she could sell West Yorks firm Holmfield Auto Spares for £1.3m and persuaded Mr Rothery to sign a contract to pay £5,000 plus VAT for marketing, followed by commission on sale. Suspicious of the high price put on his firm, Mr Rothery had two reputable business sales agents value it and they came up with a figure of £600,000. So he refused to pay RTA, which sued him for £10,000 in supposed unpaid fees and lost commission. Deputy District Judge Keith Nightingale threw out the case and was scathing about RTA’s terms. RTA 19 Clause ‘Agreement’ readable version. I/we am/are the owner’s of the said property and/or business (or are the agent’s for the owner/s and am/are authorised by the owners/s to sign this agreement on the owners’ behalf). If I/we hereby sign as an agent for the owner/s, then I/we confirm that, if for any reason the owner/s should fail to pay any fees, charges or commission due in connection with this agreement for any reason, then I/we accept that although I/we may well be acting as their agent or representative, then I/we accept personal liability for the fees due. If the said property and/or business is owned by a limited company, then I/we, the undersigned, request that you accept to act as my/our agents, and undertake that if the limited company should fail to pay the agreed fees, charges or commission by virtue of insolvency, or any other reason when such fees, charges or commissions become due and payable under this agreement, then I/we will personally pay the said fees, charges or commission to you in full, out of my/our own funds. I/we appoint RTA (Business Consultants) Ltd., as agents for the sale of my/our property and/or business, and give you sole selling rights for an irrevocable TWELVE MONTH period from today’s date subject to my/our options under clauses 12 and 13. I/we agree that these sole selling rights shall remain in force after that date until terminated by me/us or alternatively by your company. Termination, by either of us must be sent in writing by registered or recorded delivery post, and must provide 28 days advance notice. I/We agree to pay you a commission of £[written by Field Agent] plus VAT when a sale, or one of the events hereinafter mentioned takes place. I/We understand that I/we will be liable to pay your agreed remuneration in addition to any other costs or charges agreed in each of the following circumstances. If unconditional contracts for the sale of the Business and/or Property are exchanged during the period which you have Sole Selling Rights even if the Purchaser was not found by you but by another Agent or by any other person including me/us. If unconditional contracts for the sale of the Business and/or Property are exchanged after the termination of the period in which you have Sole Selling Rights but to a Purchaser who was introduced to me/us during that period or with whom I/we had negotiations about the Business and/or Property during that period. If a sale or transfer of shares (either in full or part) should take place or a sale or transfer of assets, either during the agency period or after termination of the said period but to a party who was introduced during the period or who expressed an interest during that period. I/We authorise you to accept any offer for the said Property and/or Business on my/our behalf in the sum of £written by Field Agent or such lover figure as I/we instruct you to accept, and I/we agree that there is no necessity for you to inform me/us in writing or otherwise of any offers received below the minimum sum acceptable to me/us of £written by Field Agent unless you as agents believe that such action would be in my/our best interest. Upon signing this agreement I/we agree to pay to you a fee of £written by Field Agent plus VAT. to register my/our Business and/or Property as being for sale. I/we am/are fully aware that these monies are non-refundable and are totally independent from any commission charges payable. I/we acknowledge that I/we will be liable to pay your commission as described in clause 3.b),. Following a cancellation of this agreement, for up to a maximum period of 2 years from the date of cancellation of this agreement. I/we further acknowledge that if I/we instruct, or have previously instructed another agent to sell my/our business and/or property on a sole agency, joint sole agency or a sole selling right basis, I/we may have a liability to pay fees to more than one agent. I/we acknowledge that there shall be no entitlement to commission payable to you in circumstances where a purchaser, first introduced by you, goes on to buy my/our business and/or property through another agent more than six months after this agreement is terminated. I/We acknowledge that no representations have been made to me/us by you or your representative and there are no collateral agreements or terms between me/us other than the agreements and terms recorded herein, and having agreed these terms and conditions, together with the fees and charges payable I/We hereby sign this agreement and acknowledge have received a copy of same for my/our records. For the purpose of this Agreement I/we accept that if I/we grant a lease of the property then I/we will be deemed to have sold the property and the commission as referred to in clause 3, will become payable. I/We acknowledge that the is no ‘cooling off’ period in respect of this contract and that I/We become bound by it upon signature. Furthermore. I/We accept that this contract is not conditional upon any other event that is not described herein. Fail to pay any agreed registration money by the agreed payment date. Fail to allow interested parties to view during the currency of this agreement. Should make any representations to any interested party that should deter them from progressing negotiations further. Should refuse of fail to make available to you any information that you deem necessary to assist you with the sale, including by not limited to copies of my/our full trading accounts, copy of lease and/or copy of and Energy Performance Certificate and identity documents for money laundering regulations. Refuse to sell my/our business and/or property at a price that I/we have instructed you to accept on my/our behalf. If I/we provide a cheque for the registration fee upon which I/we subsequently countermand payment or for which my/our bankers fail to honour payment. If I/we fail to provide you with the required identity papers that satisfy the Money Laundering Regulations 2007 within 28 days from the date of this agreement. 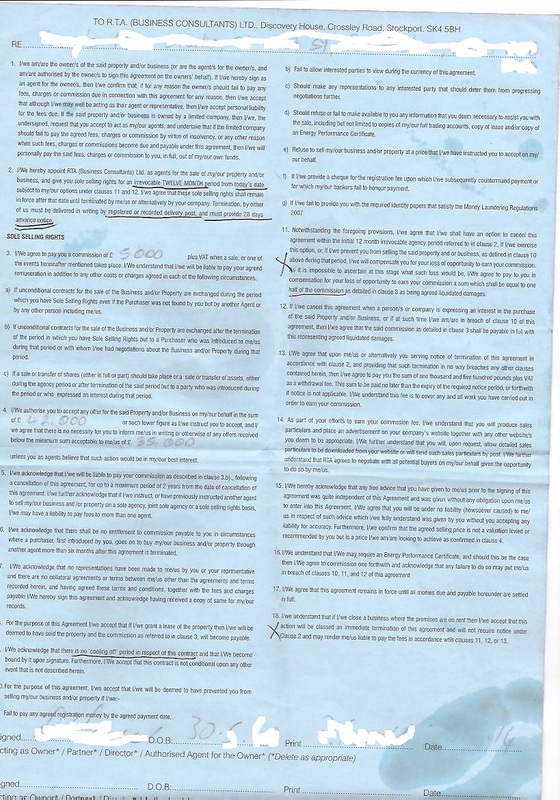 If I/we cancel this agreement when a person/s or company is expressing an interest in the purchase of the said Property and/or Business, or if at such time I/we am/are in breach of clause 11 of this agreement, then I/we agree that the said commission as detailed in clause 3 shall be payable in full with this representing agreed liquidated damages. I/We agree that upon me/us or alternatively you serving notice of termination of this agreement in accordance with clause 2, and providing that such termination of this agreement in accordance with clause 2, and providing that such termination in no way breaches any other clauses contained herein, then I/we agree to pay you the sum of nine hundred and fifty pounds plus VAT as a withdrawal fee. This sum is to be paid no later than the expiry of the required notice period, or forthwith if notice is not applicable. I/We understand this fee is to cover any and all work you have carried out in order to earn your commission. As part of your efforts to earn your commission fee, I/we understand that you will produce sales particulars and place an advertisement on your company’s website together with any other website/s you deem to be appropriate. I/We further understand that you will, upon request, allow detailed sales particulars to be downloaded from your website or will send such sales particulars by post. I/We further understand that RTA agrees to negotiate with all potential buyers on my/our behalf given the opportunity to do so by me/us. I/We hereby acknowledge that any free advise that you have given to me/us prior to the signing of this agreement was quite independent of this Agreement and was given without any obligation up me/us to enter into this Agreement. I/We agree that you will be under no liability (howsoever caused) to me/us in respect of such advice which I/we fully understand was given by you without you accepting any liability for accuracy. Furthermore, I/we confirm that the agreed selling price is not a valuation levied or recommended by you but is a price I/we am/are looking to achieve as confirmed in clause 4. I/We agree that this agreement remains in force until all monies due and payable hereunder are settled in full. I/we understand that if I/we close a business where the premises are on rent then I/we accept that this action will be classed an immediate termination of this agreement and will not require notice under Clause 2 and may render me/us liable to pay the fees in accordance with clause 14 forthwith.